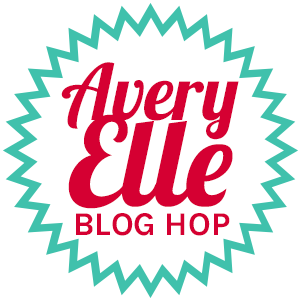 Welcome to the Avery Elle Spring Release Blog Hop! If you were at Creativation, you may have seen some of these new stamp and die sets in person! This release is just adorable. Many images for those coloring enthusiasts for sure! You can shop the entire release HERE! I am excited to share one of my favorite sets from this release: Cotton Candy. Since this image is large, I decided to do some paper piecing. I created a panel using the "nail polish marbling" technique. I thought this background was perfect for this image! (Check out my friend Amy Sheffer's video link on her post here) This technique is messy but very fun!!! Once my panel was dry, I black heat embossed the cotton candy image and sentiments onto the nail polish panel and hand trimmed out. 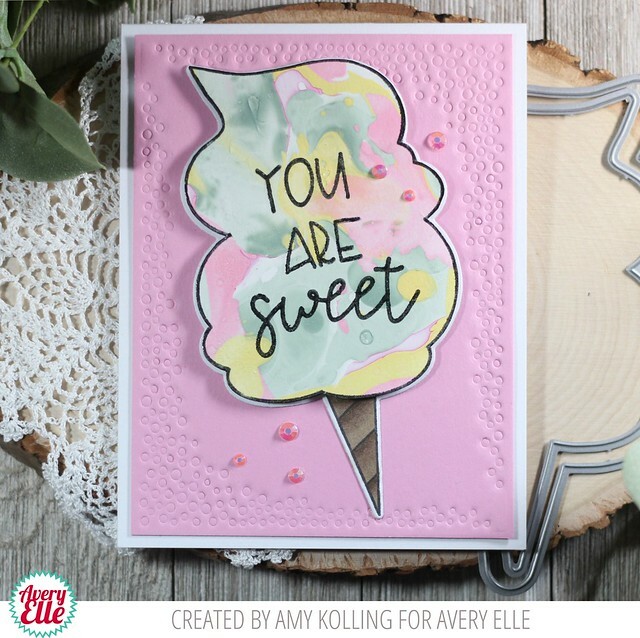 I added my cotton candy with foam adhesive to a full image that was already stamped and die cut using the coordinating Cotton Candy Elle-ments. 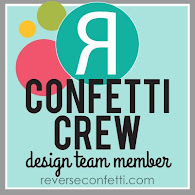 To add to the fun of this, I impressed a new die called Confetti Mat Die onto some pink cardstock and trimmed the panel down. This was added to a white top folding notecard. I added my cotton candy image from above and some fun matching gems (Studio Katia). Look at the texture you get when impressing the Confetti Mat Die! We also are debuting our new Zippered Vinyl Mesh Pouches that are perfect for all types of storage for scrapbooking, stitching, documents, etc. There are 2 sizes in both the aqua and white. 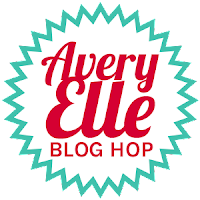 To celebrate our Spring 2019 Release Blog Hop, Avery Elle is giving away a $25 Gift Certificate to one random winner. To enter to win just comment on this post. There is no purchase necessary and you must be 18 years of age or older to enter. This giveaway is void where prohibited. You can also do options 2, 3, 4, 5 or all 6 of the following to increase your chances of winning. You have until midnight Sunday, February 10th to enter. The winner will be announced on the Avery Elle Blog on Monday, February 11th . All products are available for purchase in the Avery Elle store right now. You can check them all out here. Follow us on Facebook (we are www.facebook.com/AveryElle ) and share us with your friends - make sure they tell us you sent them. Follow us on Instagram (we are https://www.instagram.com/averyellestamps/). Thanks for sharing a part of your day!! Love this! That ice cream looks yummy! 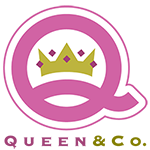 SWOONING Over the NEW Products and your SWEET Card!! It was AWESOME getting to meet you in person at Creativation too!! THANKS SO MUCH for sharing and have a FABULOUS WEEKEND!! Wow...this set is absolutely amazing and your card is so cute. How fun! That nail polish marbling looks amazing as the cotton candy!!! Brilliant!!! My favorite set. Great idea to marble the “candy”! I love this huge cotton candy image and how you can put the sentiment inside. Love the look you created. Awesome background and a yummy looking cotton candy! Awesome card! Adorable card! I like that you made the cotton candy multicolored, and I'm going to have to look into that technique. The textured background is really pretty. 1.Awww!!! How cute!!! Adorable and yummy card!!! Lovely colouring!!! 2. Follow Avery Elle on Twitter as raggiodiluce82 (Arianna Barbara) and I've just tweeted about the contest. 3. Follow Avery Elle on Facebook as Arianna Barbara and I've just shared about the contest with all my friends. 4. Follow Avery Elle on Pinterest as Arianna Barbara. 5. I'm already Avery Elle's blog follower. My grands love cotton candy, this is a truly adorable card!! Pinned it! Oh my but your cotton candy (??) looks so yummy. Your soft colors make it look authentic. I want to eat some right off the card...so sweet, Amy! I like your card with the cotton candy. What a fun card Amy! the marbling design is perfect for the cotton candy. Great card! Kudos on doing the multi colored cotton candy. What a great idea! I love the colors! 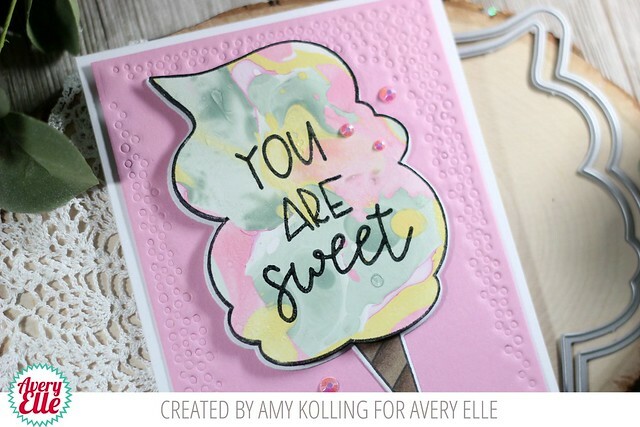 Such a fun and sweet card Amy! love the colorful ice-cream !! Great card. Look so yummy. This card is pure delight, so bright and happy. 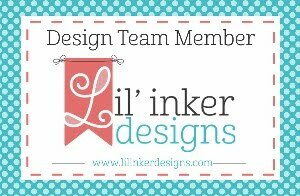 SugarPea Designs / Release Day!